A new iPhone and Android app that brings to life the rich history of Sparks, Nevada is now available for free in Apple’s iTunes Store and at Google Play. Called “Sparks NV Historic Tours,” the app is the result of over twenty years of work and research by the volunteers of the Sparks Heritage Museum. 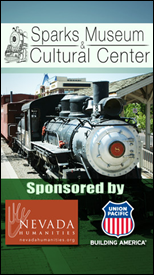 The app was sponsored by Nevada Humanities and Union Pacific and developed by Tourbuddy. Features include a GPS-based walking tour focused on the city’s original business district, with vintage photos that provide a glimpse into its past. “Stories of Nevada’s Past” are shared by historians through audio at designated stops, which include the Southern Pacific Roundhouse, Machine Shops and Union Pacific Yards & Depot. The app also features a self-guided tour of Sparks’ 4,000-square-foot museum, loaded with engaging exhibits that reflect the rapid changes the region has undergone, from ranching and mining to the introduction of the railroad, as well as the city’s significant role in the Space program. The app’s historic photo gallery includes vintage photos from the Spark’s Museum’s collection. Visitors can point their phone at an existing building on Victorian Avenue, such as Great basin Brewery, and see a photo of what the building looked like 50 or 100 years ago. There are photos of the Southern Pacific facilities and equipment that date back to the construction of the railroad, as well as photos of the trolley that once ran between Reno and Sparks. “The app enables us to share our collection, to educate residents about the history of their immediate surroundings, and to preserve local Nevada history in a digital format,” says the Museum’s Director. Sparks history is a reflection of the movements and significant eras in American history. The Intercontinental Railroad, the Lincoln Highway, Route 40 and Interstate 80 have all brought travelers from across America and across the world to Sparks and the Western states. All of these passed directly in front of the historic buildings which house the Museum making this an ideal place for a historic walking tour. There are six nationally registered historic buildings featured on the tour. With rail facilities that date back to 1904, Sparks was recognized as a member of Union Pacific’s Train Town USA Registry. Today, Sparks continues to be an integral part of Union Pacific’s 32,000 mile network and Victorian Square, the historic center of town, is a hub of entertainment.